3 pairs of low relief stone shop fronts are supplied in this kit complete with a mixture of different signs and interiors. 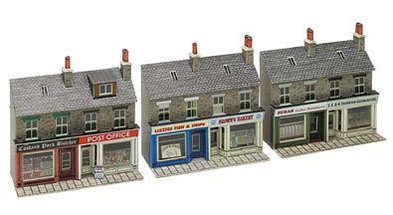 This kit will match alongside (PN121) to make a typical terraced town street. Each pair (73mm x 35mm 2 7/8" x 1 3/8").